Arcuri, of investment firm Cowen & Company, increased his AAPL price target on Monday to $155, citing the anticipated launch of a so-called "iPhone 8" later this year. However, in the interim, he sees continued strong sales for the iPhone 7 series. Citing supply chain checks, he increased his forecast for iPhone sales in the March quarter to 50.5 million, with an average selling price of $685. Still, the major catalyst is expected to be an iPhone update later this year, widely expected to usher in a new design —the first major revision since the debut of the iPhone 6 in 2014. 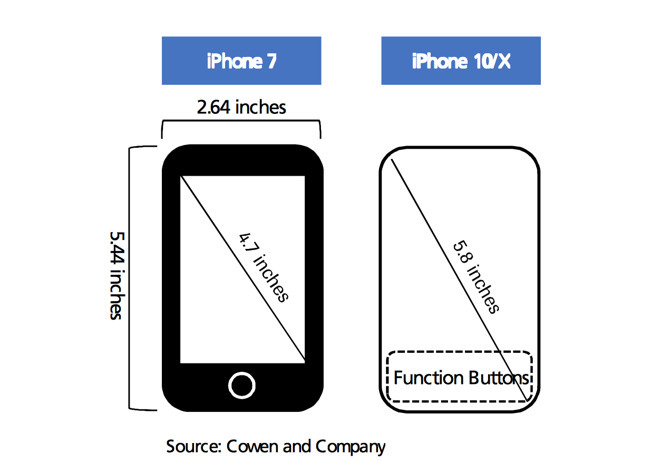 That premium model, known colloquially as an "iPhone 8," is expected to be flanked by an "iPhone 7s" series that will look largely the same as the current iPhone 7. Arcuri's forecasts call for shipments between 55 million and 60 million for the new "iPhone 8" with OLED display. He believes Apple will ship another 20 million to 25 million for a so-called "iPhone 7s Plus," and an additional 35 million to 40 million for a 4.7-inch "iPhone 7s." In all, he believes Apple could be in a position to ship some 110 million units of its trio of new iPhones later this year. Apple typically launches new handsets with a few days to go in its September quarter, with the bulk of new sales falling in the following holiday quarter. 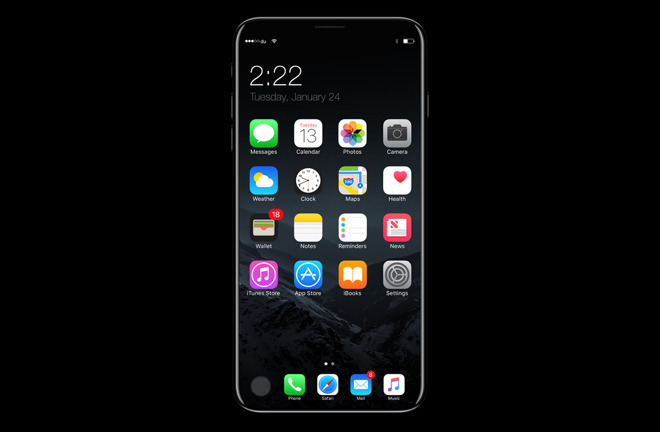 Arcuri's expectations for the "iPhone 8" are largely in line with rumors: an edge-to-edge design with a 5.8-inch display featuring a new row of function buttons and virtual home button below the primary screen. According to Arcuri, Apple is "trying to find a solution" to implement its AuthenTec Touch ID technology within the display of the new iPhone. Existing Touch ID implementations require a capacitive ring around a button, but Apple "has remained open to other options" for building a fingerprint sensor in the "iPhone 8," Arcuri claims. He also weighed in on the expected facial recognition technology Apple is expected to introduce with the "iPhone 8," citing specific suppliers for the new forward facing camera. According to Arcuri, Apple has tapped Heptagon/AMS for a new infrared sensor, Lumentum and Finisar for a laser emitter, and STM for the camera's CMOS sensor. According to Arcuri, the new 3D facial recognition technology will be exclusive to the "iPhone 8," and will not be available in the "iPhone 7s" series. Other suppliers cited by the analyst include Broadcom for a wireless charging integrated circuit, glass casing materials from Corning, and dual-sourced baseband modems from Intel and Qualcomm. He also believes all three models will include 3 gigabytes of RAM, while the "7s" series will start at 32 gigabytes of storage, and the "iPhone 8" will come in two capacities: 64 and 256 gigabytes. Cowen & Company's new price target of $155 is an increase from its previous 12-month forecast of $135. Shares of the company have been consistently above that outdated target since mid-February.